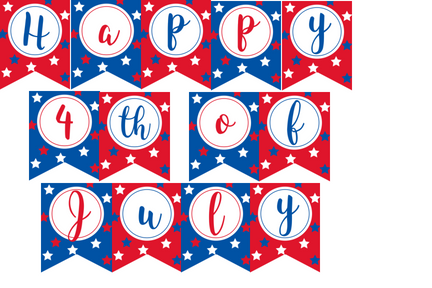 Hi there, today I have for you a new printable banner for the 4th of July. It spells out Happy 4th of July in alternating colors and is decorated with stars in red, white, and blue. Included are thirteen 5 x 6.5 inch banners. Cut out and hole punch near each edge at the top and weave ribbon, twine, string, yarn, fishing line, or whatever you have on hand through the holes to make a banner. Affix to the wall with tape or thumbtacks, depending on how heavy the banner ends up being. Check out our matching free 4th of July planner stickers too! This file is not editable and is for personal use only. Print on high quality cardstock for best results. Colors may look slightly different when printed because everyone's computer/phone/tablet screens aren't the same. I hope you all enjoy this banner and have a fun and safe 4th of July! You can find more of our free party printables and banners here.